Complementary valet and self park. The restaurant is equipped with QSC speakers and particular attention has been paid to acoustics in the dining rooms and the bar. 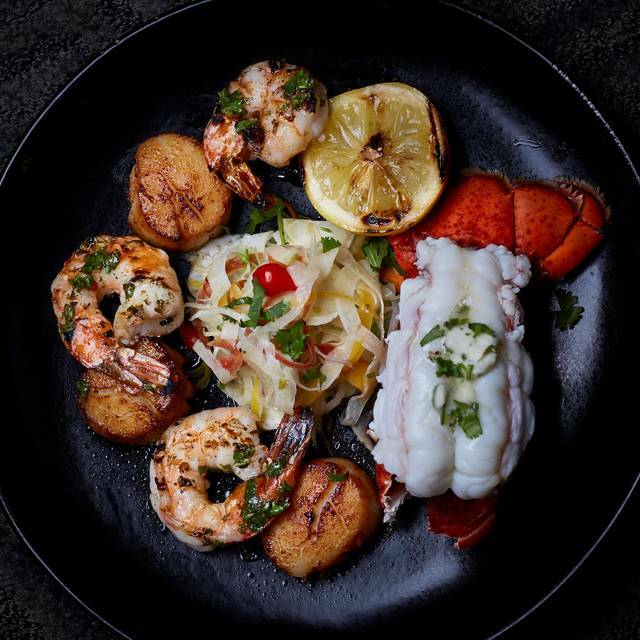 Mariposa – Latin Inspired Grill is designed for the ultimate customer experience. The views from the patios and dining rooms could be the finest world wide. 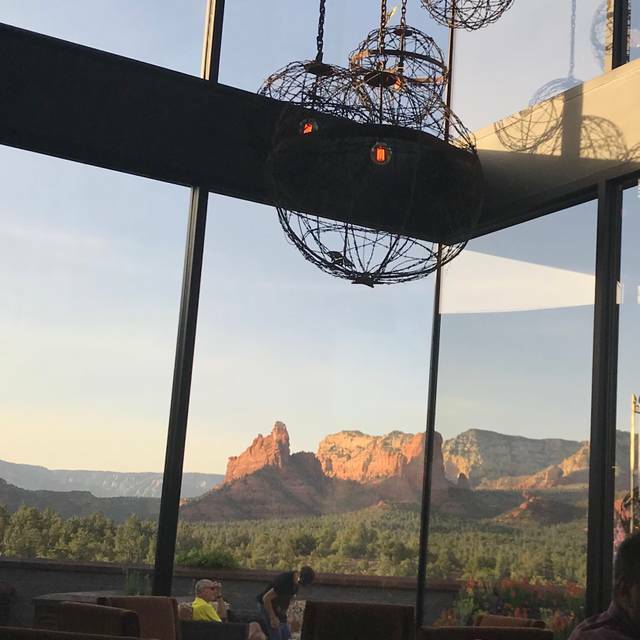 If that wasn’t enough – customers will enjoy browsing the restaurant and the grounds enjoying large scale art or star gazing in the dark Sedona night. 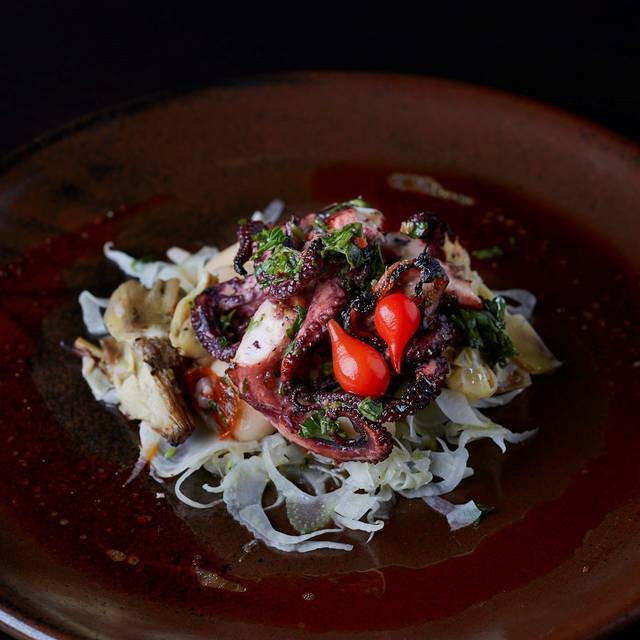 The cuisine is Latin Inspired, primarily from Chef Dahl’s interactions with chef’s in Argentina, Chile and Uruguay. Chef Lisa Dahl and her team focus on premium ingredients and many of the herbs are grown in the herb gardens in the restaurant courtyard. All meats and seafoods come from the very best sources – such as Newport and Beelers for the meats. For years Lisa has insisted on all organic vegetables from Arizona. 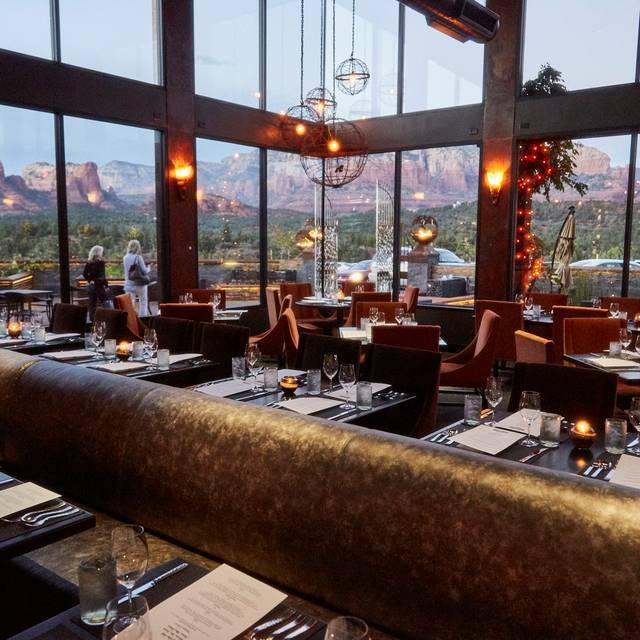 We are thrilled to offer pick up and return service to our West Sedona restaurants from your accommodations. Our luxury sprinter can handle parties of up to 11. 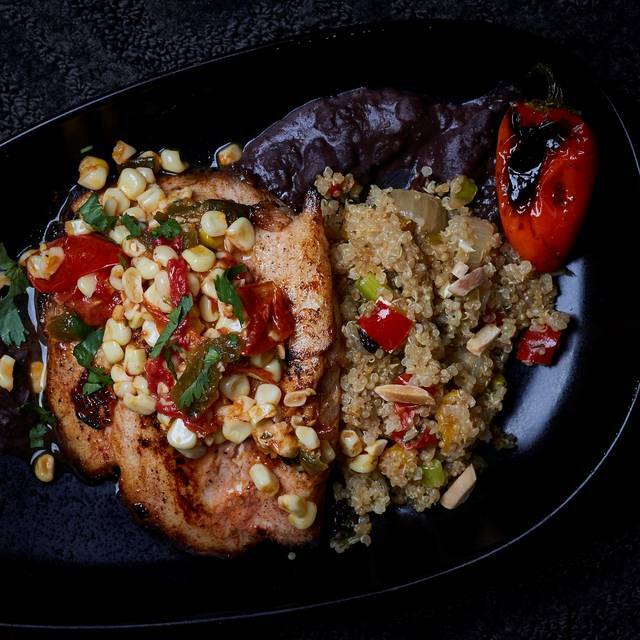 Heavenly Wood-Roasted Chicken with Lemon, Curry & Rosemary & Charred Corn. As Featured On Travel Channel's Food Paradise! Our waiter sat us at 7:30. We did not receive our drinks until close to 8:15. Waiter was busy and very MIA. Apps came at 8:30. Food came at about 8:45. We were seated at a nice table but the heat lamps were BROILING us to death. It was so uncomfortably hot and I am a person who typically runs very cold. My husbands skirt steak, which he ordered medium, was completely rare. It took them 3 tries to cook it properly but then it was a little burnt. We did not receive anything complimentary for this mistake. I ordered the vegetarian portobello mushroom dish and it was insanely salty and not good. While the scenery was beautiful...I would not recommend eating here. The food was nothing to write home about. Skirt steak was tough; halibut had some “heat”, which is not part of the description and the person who ordered it is intolerant to spicy food. Scallops were just ok- nothing subtle or interesting about flavor. Too bad because ambiance is very nice but for the price we’ll go elsewhere next time. Fantastic meal and service. A wonderful special night for our vacation. Make sure you go before sunset. The views are stunning! 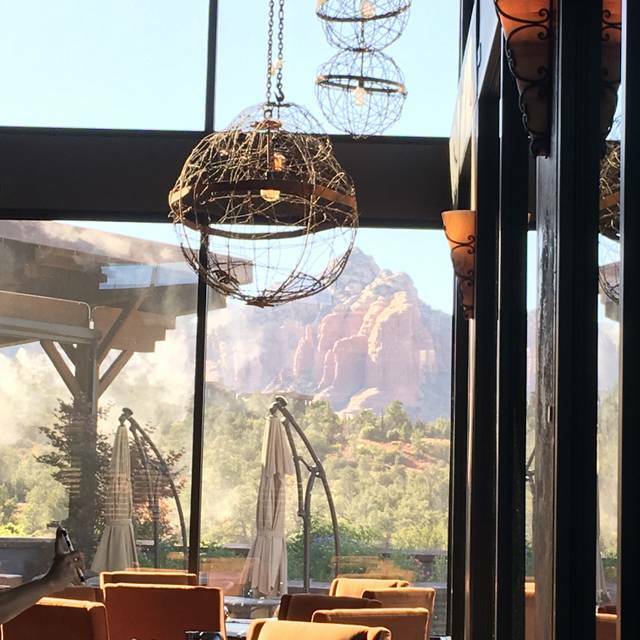 We visit Sedona about twice per year and plan all of our visits around Lisa Dahl’s restaurants. That’s how much we love her food! Mariposa is not just great food, service, ambiance, views, etc. ; it is a fantastic EXPERIENCE. We eat there twice every time we come and have never had a bad experience. When Lisa is at her restaurants, she will come around and speak to the patrons. She’s super down to earth, and grateful to the people who frequent her restaurants. It’s a MUST DO for Sedona! Were on vacation. Beautiful setting. Go early and have a cocktail and enjoy the scenery and take pictures. Our service and the view were exceptional so no complaints there. We were told about the menu, not rushed but the food was just okay. For spending $300 with tip I expect more than okay. The Elote and empanadas were delicious but the salads were overdressed and tasted more like store bought than house made dressing. It was suggested we do the steak and seafood trio to try different things. I wonder if this was our problem. The scallops on mine were great but the lobster was nothing special. The shrimp was a little cold and the salsa paired with it wasn’t an easy thing to eat together. For the meat trio it was steak, lamb and chorizo. Everything was prepared as we asked but nothing was memorable. Our service and view will be remembered but not the food. I think most people come here for the views and those did not disappoint. The building and surroundings are gorgeous. The service was excellent too. The food itself though was not great. The fried avocado app did not have much taste. My husband had the halibut special and said it was dry. I had the ribeye steak and it was served undercooked and very rare when I had requested medium rare. I was surprised at how thin the steak was too. I love this place!! We have been coming here for years and plan to keep coming here for many years to come. Delicious and interesting food, great ambience and great service in a truly spectacular setting. What else do you want????? Thus is foodie heaven!! This was the best restaurant we enjoyed in Sedona. Beautiful atmosphere, excellent service, and wonderful food. The vegan filet was so incredible- vegan version of a steak dinner and didn’t miss any of the flavour! I recommend to anyone visiting this area! Empanadas were very small with very little filling. I ordered the fish of the day, halibut, and it was very overcooked so I had to send it back. They got it right the second time but this place it is overpriced for the food you get. I rarely write reviews at all, but I feel obliged to report that our experience was quite disappointing. We never send back meals; we might mumble to ourselves that the food wasn't that great, but that would be it. Here, we needed to send back two of the four dinners we ordered. My halibut wasn't just a little underdone - it was fully rare in the middle, and my husband discovered that his chicken dish was cold. He asked me to confirm. It wasn't just slightly cool; it was cold, as if the meal were prepared beforehand and never fully warmed up. Our waiter was very apologetic and promptly replaced the chicken and cooked my halibut. In addition, we ordered one side but got something else. Again, our waiter addressed our concern promptly and apologized but all of this significantly detracted from our experience. I admit, I would have left with slightly less disappointed feelings had they offered to comp something - even a glass of lemonade! But we received no such acknowledgement of their deficiencies. The view was outstanding, though. Amazing views, great service. Best meal that we had in Sedona. I ordered the halibut special, and it was the best halibut I've ever had. The Latin "twist" enhanced the taste, and it was perfectly cooked. 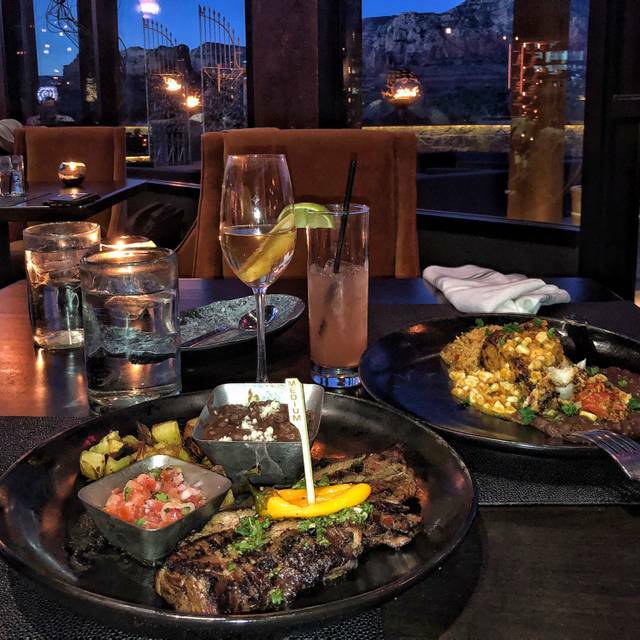 Amazing dinner with the beautiful backdrop of the red rock and views. We started with an octopus appetizer and cauliflower/carrot soup that was so tasty and both very large portions for appetizers. By the time my halibut came out I was half full! My boyfriend ordered one of the steaks that was cooked perfectly, with a side of lemon/arugula mashed potatoes. The decor and open layout is very elegant and to go for just drinks would still be a treat (we ordered house cocktails as well). This restaurant was recommended to us by friends and we will definitely return the next time we are visiting Sedona. We were fortunate enough to get a fantastic seat on the patio looking out at red rocks. It was spectacular view. It seems a lot of people come for the view and parking was serious issue. At first valet wouldn’t take our car as he was full. Drove around endlessly until people left. Not a great first impression. The server seemed rushed and indifferent. The food was good with the filet being best choice. Our two other expensive steaks (ribeye and strip) were a little chewy. My husband thought they needed a better butcher. Sides were good but pricey. Definitely come for a cocktail and appetizer on the patio but dinner is a maybe, especially for the price. Would 100% go back. Great food and ambiance with amazing sunset views. We had an Incredible experience! The service was on point and the food was delicious. The view was truly breathtaking. We had an unforgettable night. Everything here was wonderful, especially our server Victoria! The view is awesome, the food was delicious and the service was beyond great. This is by far one of my favorite restaurants in the U.S. On our trip we had dinner one night and it was so good we came back for lunch the next day. The Yucca fries are the BEST! Attention to detail in beautiful surroundings inside and out. 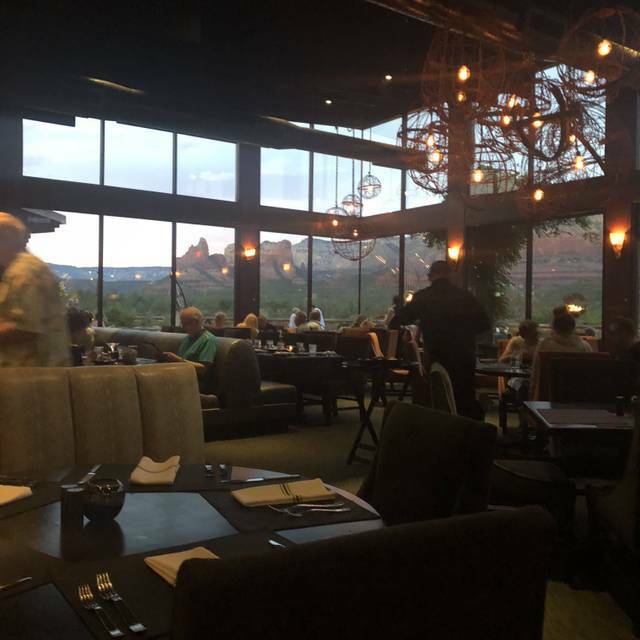 Dinner with sunset views of of infamous Red Rocks of Sedona. Food and drinks were fantastic. Service was top notch. We went back later that same evening for dessert and drinks at the bar which were superb as well! Will definitely make it a regular stop every time in Sedona. Simply remarkable! From the moment we arrived it was special. The cocktails, the food and the incredible service! The view was terrific, but the food and service were even better. Arturo was our waiter, and provide everything we needed to know about the food and beverages. This place is a winner, as evidenced by the large crowds of patrons. We will return. Amazing views!!!! Busy bar.. impersonal bartender. Otherwise nice evening. Fabulous food service and one of the best views EVER! Gorgeous food, love the ambience. Food was exceptional. Delicious and very generous portions. Decor is absolutely stunning. A wonderful dining experience. We ordered Chef Lisa Dahl's Prix Fixe Menu and it did not disappoint. Service was exceptional. Our wait staff, Erin, went above and beyond to make our experience one that we would not soon forget. The view from the patio is as advertised, fabulous. Our great experience began at the host stand when we entered the restaurant. The staff was professional, friendly and made it obvious that they were committed to making our evening an enjoyable one. Visitors to Sedona cannot enjoy the "full Sedona experience" without spending an evening at the Mariposa. 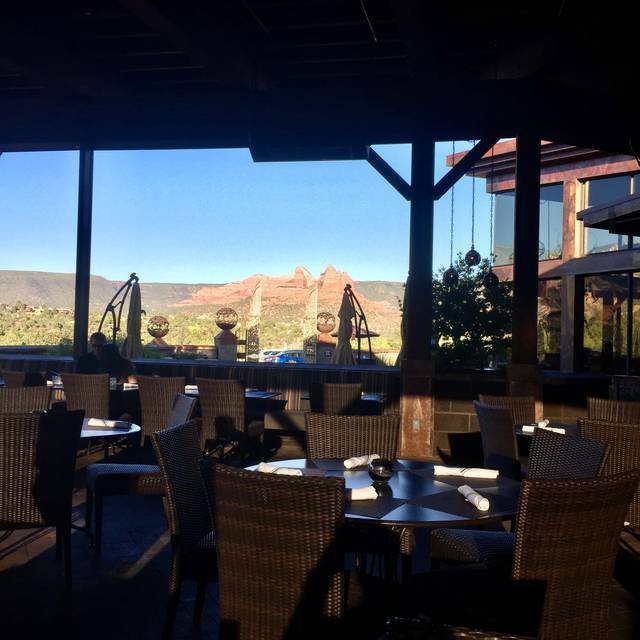 We are looking forward to dining there again the next time we are in Sedona. Although we were not able to visit during daylight hours and therefore missed the fabulous view, we had a lovely dinner and enjoyed the ambiance, service, food, and drink. Will be back next time I am in Sedona!